Lightly used great condition. I will also send you the Aurvana pads I bought from Amazon. Audeze SINE DX Open Back On-Ear Planar Magnetic Headphones With Standard Cable. Condition is Used. Shipped with USPS Priority Mail. WE ARE ANAUTHORIZED AUDEZE DEALER! Nearly double the magnetic driving force. Patented Fluxor™ Magnet Arrays focus the magnetic flux nearly doubling the power driving the diaphragm for even lower distortion and greater accuracy. Near zero distortion. Compatible with all ZMF Audeze Kennerton headphones with 4-pin mini XLR inputs. -Braided cable sleeve. -4-pin mini XLR connectors. Audeze LCD-XC Closed Back Planar Magnetic Headphones Zynsonix Ballista Cables. Near mint condition. One owner. Purchased directly from Audeze. Ships in all original packaging and includes everything that came in the box, including: -1.9M 1/4” to dual 4-pin mini-XLR cable -3.5mm adapter -certificate of authenticity As a bonus, I am including Zynsonix Ballista 3.5mm super premium cables (valued at $200). Moon Audio Black Dragon Headphone cables for Audeze -- 10 feet long. 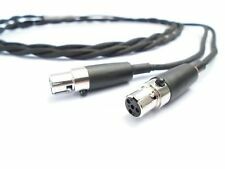 Left and right channel 3-pin XLR plugs with adaptor for use with a single standard phono plug. Like new condition. Now you can hear high-quality audio from an EL-8 headphone through your iPhone or any other Apple iOS device. Lightweight, highly flexible. WE ARE ANAUTHORIZED AUDEZE DEALER! Pro-quality XLR connector on the amp side. Balanced cable with four conductors in a flexible braided jacket. LCD Balanced Cable. Length: 6.2 ft (1.9 m). Flexible tangle free construction. The Audeze Sine is the world's first on ear headphone using planar magnetic technology. It is lightweight and flattens for easy storage and travel. Box is used, headphones are not. Audeze EL-8 Titanium closed back Headphones inc. Cipher cable. Condition is Used. Shipped with USPS Parcel Select Ground. Received as a gift and never used it. Excellent condition Item includes: Headphones iPhone cable Plus sound balanced cable Two other cables Case Please feel free to ask before you buy. 4 ft total cable length. All pictures are of the actual item for sale. Includes 6' DHC OCC Copper 6.3mm cable and case. Tested and fully functional. One previous owner used minimally. Excellent used condition. Very little wear anywhere on headphones. Single Owner. Otherwise the headphones work perfectly and sound VERY VERY NICE! You get the other Stereo Cable too. That I did not use as much. Audeze headphones can nicely benefit from a good cable upgrade. We use top-shelf Mogami 2893 shielded braid, beefy gold Neutrik 1/4" stereo plugs and quality Redco 4-pin 'mini' XLR connectors into the ZMF / Audeze headphones. Silver Widow litz 25.5AWG (OCC Stranded Litz Silver with Gold/Cryo) The only OCC Silver/Gold Litz cable on the market. 2x3pin xlr soldered with 5% copper and 5% silver by AirTech Audio. You all know the quality of Frank's Toxic Cables. 6 ft total cable length. Truly, there's no quality corners taken here! Audeze SINE DX Open Back On-Ear Planar Magnetic Headphones With Standard Cable. Condition is Used. Shipped with USPS Priority Mail Large Flat Rate Box.